Most people have the misconception that Marijuana is a recreational drug only. But what people do not realize is that it is also, in many cases, people are utilizing it for medicinal purposes. Marijuana comes in two varieties: Sativa and Indica. Sativa is popular for growing in warmer climates while the Indica variant typically grows better in cooler climes. Sativa has lighter and skinnier leaves while Indica varieties typically have a darker tone and broader more fuller leaves. While the plant of the Sativa variant takes about 9 to 12 weeks for harvesting and grows to a height of 6 feet to 20 feet, the Indica plant takes about 6 to 8 weeks to mature for harvesting and grows to a height of about 2-4 feet only. 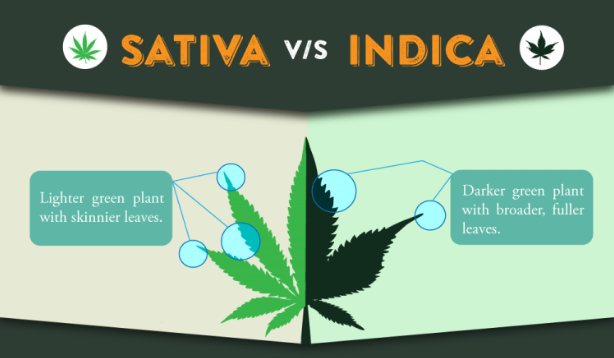 Check out the infographic below to learn more about the differences of Sativa vs Indica!